Dogs have been one of the best companions as well as protectors for humans for many centuries now.Dogs are kept as pets everywhere now and have become an integral part of our families and lives. The Most dangerous dogs list is made keeping those dogs in mind which make good aggressive guard dogs and are specifically trained to be so. Some people who have kept these dogs treat them like their own children and face no threat from them at all! While we were making this list of most dangerous dogs, many of the aspects has been kept in mind like best guard dog, nature and aggressiveness of the specific dog breed. The main idea of this article is to show you how dangerous yet efficient these dogs can be as guard dogs. It is a fact that no dogs are dangerous, it all depends on the owners and environment in which they are living so enjoy the list. when we made this article, all we had in mind was to inform new or would-be owners about these lovable dogs and let them consider if they can live up to the dog’s expectations. Calling these furry critter Most Dangerous Dogs does not mean that they don’t understand love or cant give you tons of affection; these dogs would give their lives for their owners without even thinking twice about it! But all this comes with proper training, love and time spent with your pet. The Top 10 Most Dangerous Dogs list is in no way meant to be derogatory to the dogs nor is it trying to deter people from owning or adopting them. We love dogs as much as other people (i have two Russian Bolonkas) and know the joys of keeping and caring for a dog. I got a lot of angry comments on this article due to some misunderstanding with the direction and gist of this article. Chow Chow is one of the fluffiest dogs present on this list of most dangerous dogs. Chow Chow is one of the most ancient dog breeds which originated in northern china almost 2000 years ago. They were primarily used for helping shepherds as well as hunting. As far as the nature of Chow Chow is concerned, the overall analysis proves that it’s an active breed and people love to keep it as a pet for guard dog purposes. The normal weight of Chow Chow varies between 22 – 44 kilograms. As compared to other dogs, Chow Chow has 44 teeth while mostly the dogs have 42 teeth. Dalmatian dogs are cute white skinned dogs with black spots which make them even more attractive. In early 1700, Dalmatians were used for coaching dogs and they fight off intruding animals and robbers who cross into their territory. It’s true that Dalmatians have lot of energy and they are pretty fast and active. Dalmatians tolerate other animals and humans till their limit and step away rather than fight. They are good to keep as pet dogs but they also have a restless nature. The cute looking Dalmatian dogs have weight between 20 – 32 kilograms and are mostly found in Yugoslavia. Boxer is one of the most interesting dog breed all over the world but also counted in the list of most dangerous dogs. The name was given to it on its funny moves while playing with its owners which looks like boxing! One interesting thing about this breed is that Boxer breed holds the record of the dogs with the longest tongue. Boxer has weight between 23 – 33 Kilograms and is mostly found in Germany. Boxers are popular because of their nature while on the other hand, it has many plus points like it can be a very good family dog. Powerfully build and exploding with energy the boxer is a true athlete and is a very dangerous guard dog against robbers and theives. Presa Canario is one of the biggest and most dangerous dogs breed. Having the weight between 37 – 55 kilograms these huge powerful dogs are not only dangerous but they are very frightening looking. The origin of this dangerous dog is Canary Islands and it is one of the most outstanding guard dog breeds of the world. As far as the nature of Presa Canario is concerned, it does not get aggravated easily and only an experienced handler can calm it down. The biting power of Presa Canario is so strong that it is almost impossible to escape out of it easily. Alaskan Malamutes are a very hard working dog breed. Alaskan Malamutes are mostly found in highly snowy areas where the normal transport is very difficult to find or operate. Alaskan Malamutes has many plus points as compared to negative ones but even then they are dangerous because when this dog gets instigated, it’s very difficult to calm it down. These dogs don’t walk alone in the wild and this clearly shows that if they don’t walk alone then they don’t attack alone as well. The weight of Alaskan Malamutes varies between 35 – 46 kilograms and mostly found in Alaska. Huskies are almost the same as Alaskan Malamutes in looks and nature. One interesting thing about Huskies is their howl can be heard even 10 miles away! The original name of this breed is Siberian Husky and they are very strong and silent. They are actually from the North East of Siberia. One thing which makes Huskies unique is their striking eyes which are icy blue. Huskies have a double layered coat which is so dense that even the arctic temperature is not a problem for them. As far as nature is concerned so they are friendly but sometimes very aggressive if rubbed the wrong way. Weight of Huskies varies between 20 – 30 kilograms. Doberman Pinscher is a forceful one man dog. Doberman Pinschers are a popular choice among dog lovers all over the globe because of its various characteristics like it’s one of best human companion, loyal, easy to train, confident, highly intelligent and one thing which sometimes humans don’t have and that is trustworthy. Along with many of these qualities we cannot forget or neglect the anger level of Doberman Pinscher because once its angry it sometimes become very difficult to make it calm down! Most of the times, armed forces keep this dog with them to handle thieves or robbers as well as to detect contraband or explosives. Their weight varies between 30 – 42 kilograms and the origin of Doberman Pinschers is Germany. German Shepherd is one of the most popular dog breed all over the world. German Shepherds are fearless, extremely intelligent, active, versatile, very easy to train and loyal dogs. Almost all of the countries of the world have them right now in their armed forces. The loyalty level of German Shepherd can be determined like this that if you are a soldier and German Shepherd is your pet or companion dog then he would be the first one to take the bullet for you. Weight of German Shepherd varies between 32 – 46 kilograms. Why they are counted in the list of most dangerous dogs is because of their protective nature which makes them a formidable foe for thieves as well as intruders. 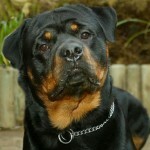 Rottweiler is one of the most dangerous dog breed of the world and has been banned in many cities all over the globe. If anyone wants to keep a Rottweiler, he has to be very much dedicated to it because Rottweiler requires lot of attention and love. These furry animals are very dedicated to their owners and gaurd them with their lives! Rottweiler has massive stopping power and they are not afraid to use it against any attacker or intruder. Their Weight varies between 46 – 59 kilograms. Rottweiler jaws are the most powerful jaws as compared to all other dogs of the world. Pit Bull is the most dangerous dogs breed as well as the most misunderstood ones which existed ever. With a head turning reputation from Denver and parts of Florida to Great Britain and New Zealand, Pit bulls are a misread breed. Make no mistake while making any type on contact with Pit Bull because it is not a dog for everyone. This dog has big strong muscles and the big jaw is an eye catcher. Pit Bulls have the title of having the most powerful biting power all over the world among dogs and is currently the most dangerous dogs breed present in the world. Weight varies between 25 – 30 Kilograms. In the end I would like to say once again that no dog is dangerous. It’s the way their owners raise them to be. 28 comments - What do you think? A provocative isnihgt! Just what we need! Rottweiler and chow chow is awesome. outstanding post, brian and his team is awesome. Thanx for the appreciation Kevin. we are working on lot of posts related to Top 10 including all of those you have mentioned.. 🙂 Keep visiting and sharing the knowledge of Top 10. It’s nice to see you like my Doberman picture. But you should respect the rights of photographers and give credit or buying licenses instead of just publishing the work without permission. I have been exploring for a little for any high-quality articles or blog posts in this kind of house . Exploring in Yahoo I eventually stumbled upon this website. Studying this info So i’m satisfied to express that I’ve a very good uncanny feeling I discovered just what I needed. I most unquestionably will make certain to do not put out of your mind this website and give it a look on a continuing basis. This is scare-mongering in the extreme. The historical background to each dog may be accurate (although sketchy in detail). The conclusions drawn are far from true. No statistics are given about the number of recorded dog attacks from each breed. Postal workers report more dog bites from West Highland Terriers and Jack Russell Terriers than any other breed. As dog handler and trainer of 40 years+, I have never felt threatened by any of the breeds above. thanks for lending your expert opinion on this matter f.ember! Being a specialist in this field, you can pick the slightest of signs of uneasiness or irritation on the part of the dog which normal people don’t. We don’t imply that these dogs are to be held responsible entirely for dog attacks because most of the times people dont know how to act around a dog to whom they are total strangers. its just that each dog has its own level of aggression and temperament which makes them different from others! What kind of article is this with these pictures. I will tell you the most dangerous animal. HUMAN BEINGS! I have and do have chows, German Shepherds, and Rotties. The pits are one of the nicest breeds. You are killing dogs by writing this slander. That’s a very dangerous comment from from one of the most dangerous animals on earth. Thank you for making me realize this! I think it’s sad you would judge entire breeds on gossip. We love our pit and two of her friends, also pits. She is loving, sweet and nothing like you make them out to be. Should all journalist be judged by your ignorance? Moans neither should breeds.NOT only do We love our pits but We also loved my sisters German Shepard the 13 yrs he lived. He just like our pits NEVER hurt a soul and that leads to my sister in law who has Rotties! Three of them and they are as sweet and smart as could be. Shame on you.If you can only accuse breeds as a whole, you shouldn’t write any more. thank you for taking out time to leave a comment. I am really confused right now about this article and i think its better to take it down. You are so miss informed and igorant at that. I once thought Pitt Bulls were the most aggressive dog to have I listened for all to long to people like you, it wasn’t until I did my own research and met some of the most loving and loyal dogs on earth. It is the Pitt Bull. I have never been biten by a Pitt Bull but have been biten by a few toy breed dogs. There was a Pomeranian in CA. a few years ago that mauled a new born baby to death. As, far as the Dalmation is concerned if you haven’t realized that it is not the mascot anymore because of its aggression tendacies. A vet I know did an interview and he was asked a question and of course what the vet said was not the response the interviewers were hoping to get. The vet said that in all of his years of treating dogs he has been biten by every breed accept for the Pitt Bull. I think before people spit vomit out from their mouth they should get their facts straight. Why is it that so many actors, actresses and other famous people are getting Pitt Bulls? It certainly isn’t because they want just any dog. They are looking for a dog who is gentle, loving and loyal. The Pitt Bull is so eager to please. Real sad that you also wrote a horrible piece, but then edit people’s comments when the put proof up against your point and give their opinion? Can’t handle some criticism, then get out of journalism! Half the people who commented on here against you are 100% correct saying you have no clue what you are talking about! Any animal can be dangerous at any time, however, you posted something condemning animals to death sentences around the world. Sleep well with that on your plate! about the editing stuff, you are so very right. we are guilty as charged but its only certain words which trigger these editing of comments. you must be friends with the other reader who wrote a really great comment but used certain words. As far as criticism goes, its the only thing we have for guidance and its one of our best weapons, both for attack and defense. Please be aware that we are no animal killers or haters!!! Ther is no such thing as a dangerous dog it is more like dangerous owners that do not respect the breed and mistreat the dogs so they feel threatened and defend not attack! I’m sorry people but this list is accurate! I live at a huge residence with thousands of houses, and we hear anything that happens on people’s properties, from dog attacks to burglaries and all that. I have seen all of these dogs in real life on the list here, and let me tell you, right now the dalmatian and the german shepherd are the only ones not put to sleep until now. except for those two, there were multiple attacks by all others on children and adults, and the owners of pittbulls and rottweilers were taken under custody, since it’s illegal in my country to breed or own them. As a little girl, I remember being chased by two huge dobermans but thank god I was riding my bike when they ripped their chains off of the ground. I’m not saying that they should be put to sleep for no reason, but these dogs should not be bred in the first place. When you do some research, you will see that people bred most of them by combining genes from different dogs (Oh and I have a genetics degree, so I know what I’m talking about), which is not healthy, not normal, but lethal, because simply put, it’s just not how it was meant to be. I love animals, and I looked after and took care of many (fish, lizards, turtles, mice, rabbits, cats, dogs), and I have a golden retriever who I’m in love with. and from experience, these dogs are just dangerous. Don’t sugar coat it by saying it’s the owners, or pomeranians bite, or stuff like that. Honestly, yes, I can train my golden retriever to be a vicious killing machine, (and believe me, even though he is a golden r., he is the strongest, most stubborn and “naughtiest” golden retriever I’ve ever met in my life) and some people do that to the pittbulls for dog fights (and I hope they go to hell for that), but take it from someone who knows, 90% of the time, it’s the dogs and no one is to blame other than the breeders. Thank you for this informative list, my friends ask me what dog they should/shouldn’t adopt/buy, and now I have something to say about which ones to avoid (other than my own experiences which I thought to be random occurrences until now). I don’t won any dog (though am going to get 1 – either G Shepard or Labrador). Lot of my friends own dogs & I have observed 4 of these breeds personally – D Pincher, G Shepard, Boxer & Pit Bull. Though, there might be individual cases differing, but I feel your top 4/5 is fairly accurate. For some reasons, the pit Bull of my cousin frights me & other family kids, none comes closer to that dark black beast. But, the dog itself is very calm & cool; only once it chased an intruder with horrifying barks. Personally, I am most afraid of Doberman, it’s hanging tongue, spreading jaws & chasing speed. It’s barking is even more frightening. Though, listed at 3, but I had never been threatened by G Shepard. It’s so intelligent, polite & cool. Once I saw a GS chasing an intruder, got him on floor & bite a hand at wrist, but in a way that it just kept the man honest, no penetration, bleeding even swelling. Kids love it & the Dog somehow identifies a 3 years old baby & a full grown man, acts accordingly. & man, it has smelling power & radar like hear. Pit bulls, German Sheps and Doberman dogs do tend to tend aggressive if they have been trained to do so…and such trained dogs can be quite deadly. I’ve heard that tired old line from DOG people for years, “It’s Not the Dog, It’s The Owner”, and it’s a lot of BS! It isn’t the owners that attack and kill or maim people every year, is it? It’s the Damned DOGS! I once saw a Pit Bull attack a mother cat and her kittens (A REAL brave dog!) and it not only killed the mother and two kittens, but the damned creature ATE the two dead kittens! I HATE dogs!